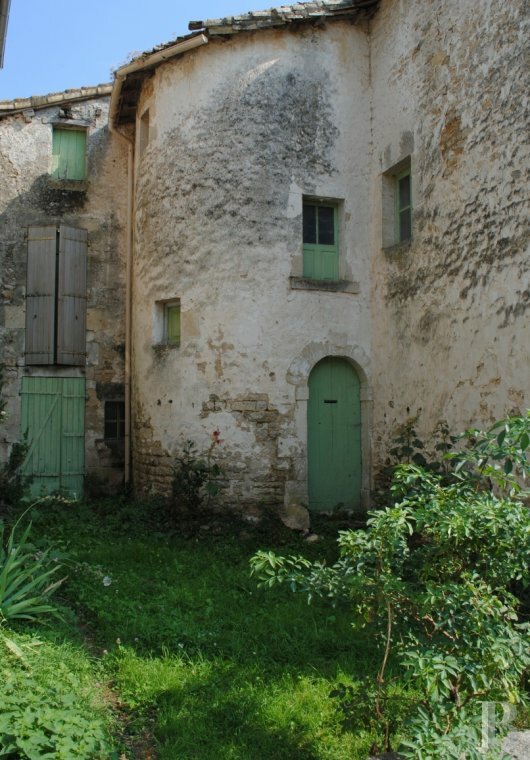 A large, 18th century village house with a second house from the same era awaiting restoration in the French department of Deux-Sèvres - property for sale France - in South-West, Perigord, Dordogne, Quercy, Limousin - Patrice Besse Castles and Mansions of France is a Paris based real-estate agency specialised in the sale of Residences. 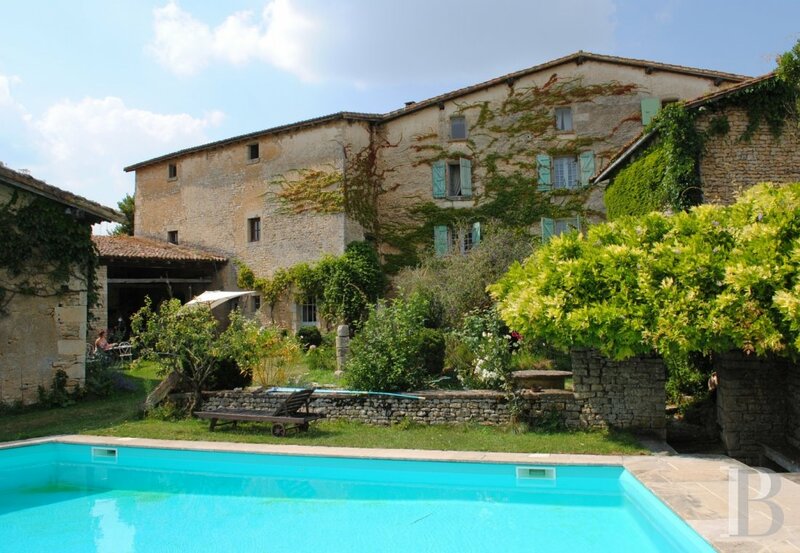 4 hours from Paris by road, including 375 km on motorway (15 km from a slip road), and 15 km from Saint-Maixent-l'École TGV train station which puts the French capital just 135 minutes away by train, with some direct links. 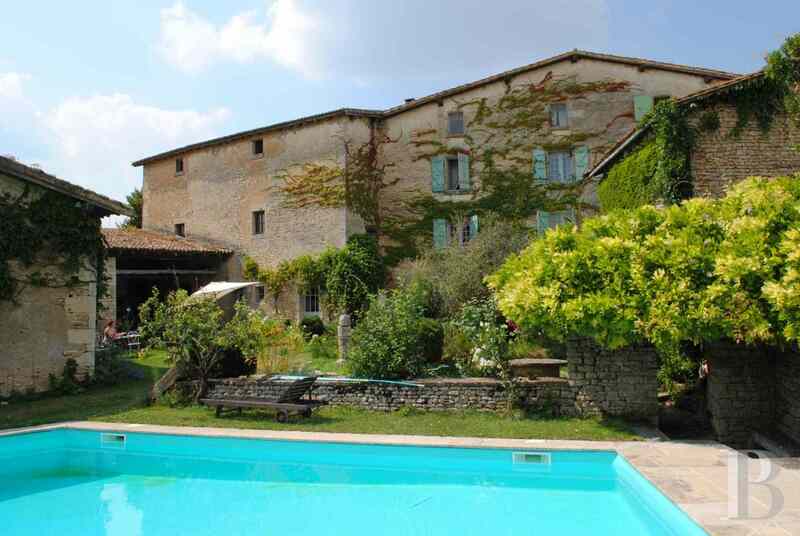 50 minutes from Poitiers-Biard airport with its daily flights to London. 4 km from a small town, with a large market, shops and restaurants, renowned for its antiques’ market in the summer and its truffle market in the winter. The village, quite sleepy nowadays despite its agitated history, is not far from a major Neolithic site. The two houses adjoin one another and take up most of an urban plot. 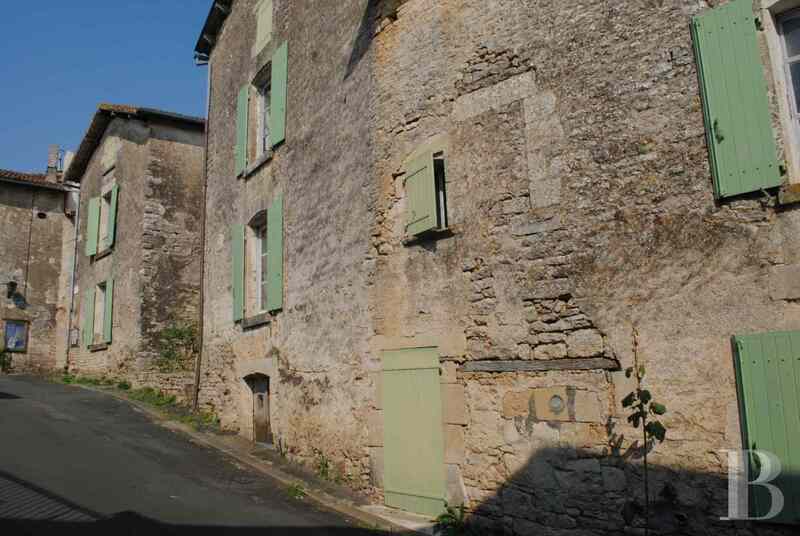 They can be reached via miscellaneous entrances off three narrow, little-used streets that go past. Both entrances on the north side are predominantly used by pedestrians. The large, main house, built at the end of the 18th century, has several sides. Its north-facing door is outstanding. Its impressive south-east-facing facade makes it possible to take advantage of the heat in the winter and to protect its residents in the summer. It is dotted with almost regularly arranged openings, providing the garden with an unpretentious backdrop, bordered on one side by outbuildings used for a variety of purposes. A street entrance on the south side provides access to the garden and the swimming pool, going as far as the summer dining room and its arbour, standing near to the summer kitchen. 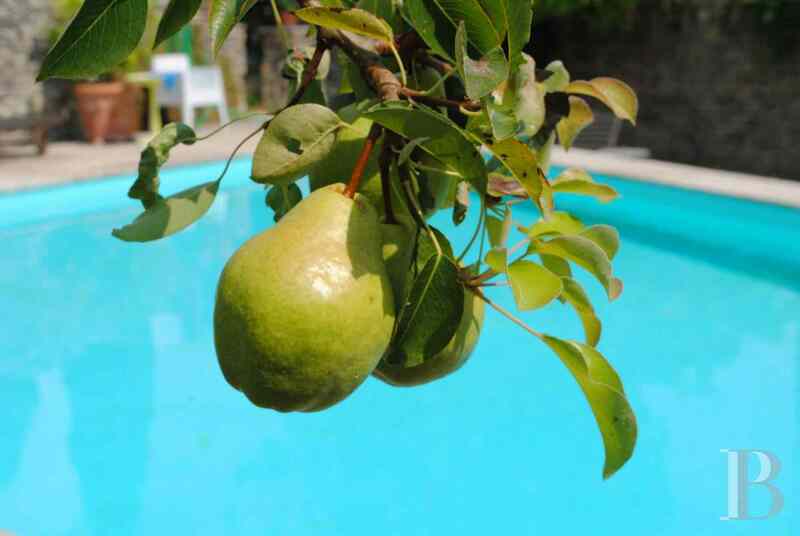 The property’s small orchard is on the other side of the street, on the banks of the river Sèvre Niortaise. 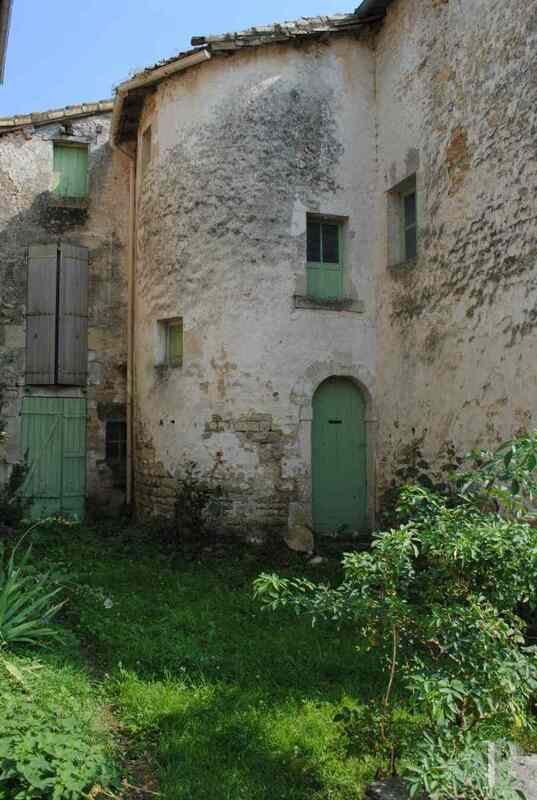 The second house which dates from the beginning of the 18th century awaits restoration. 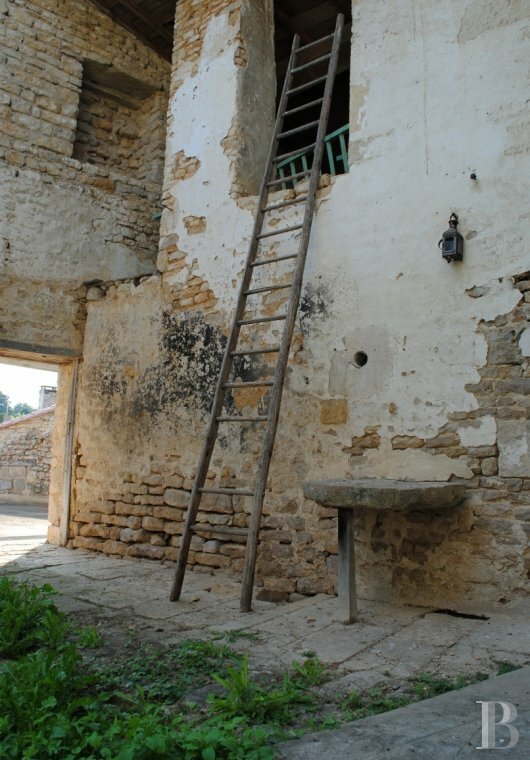 Standing at right angles to and adjoining the first house, it can be reached via a small courtyard and a semi-circular arched door, dated 1724, set in a tower. 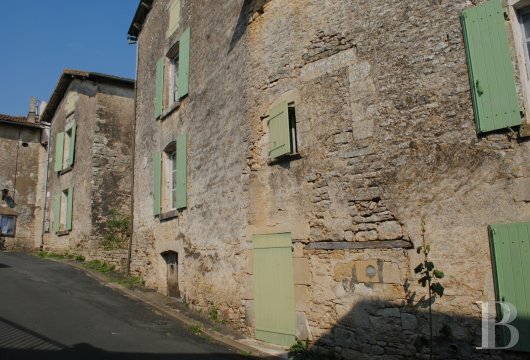 The house runs alongside the narrow street that leads to the Sèvre 60 m further on. 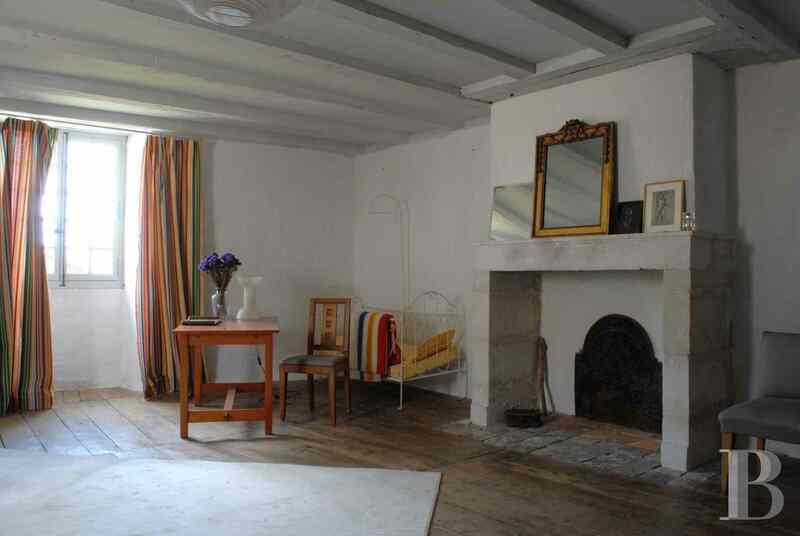 This large house, built in 1792, still has numerous period features. 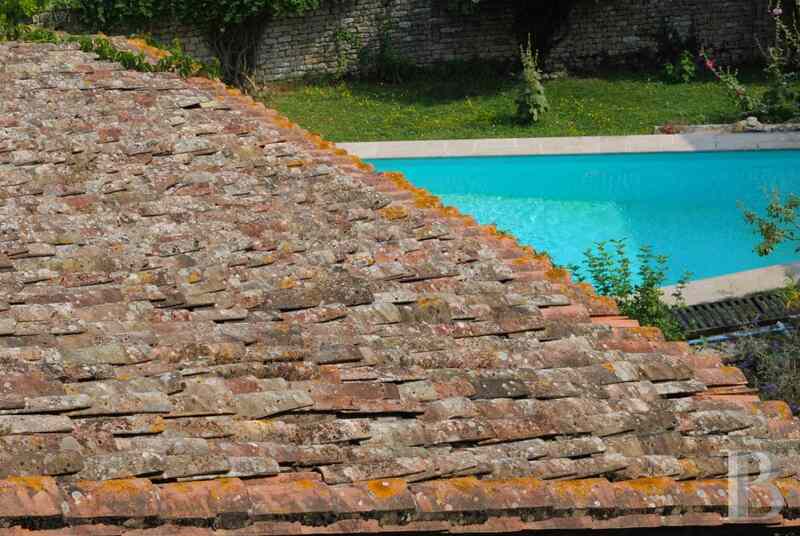 Its L-shape and its Roman tile roof, in harmony with the other village homes, give it a southern air. The roof was redone by the current owner. 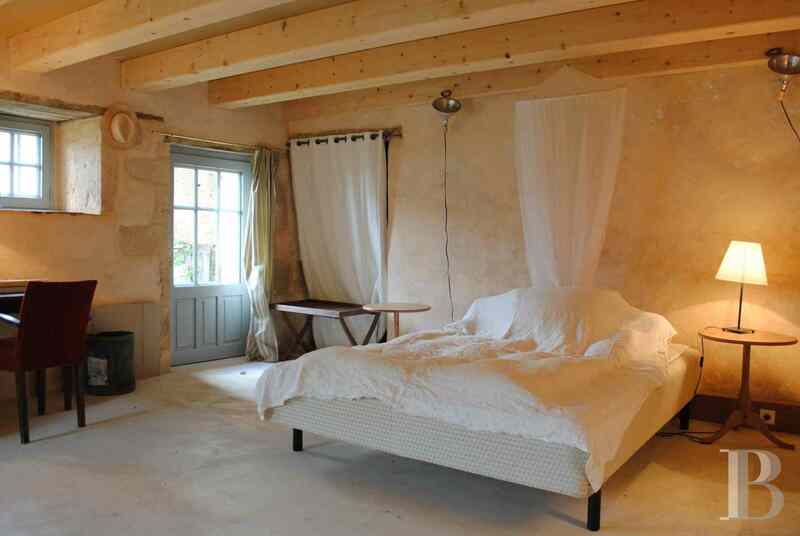 Built of carefully laid limestone quarry blocks, it has dressed stone window framing. The rendered facades, in a good state of repair, are luminous. 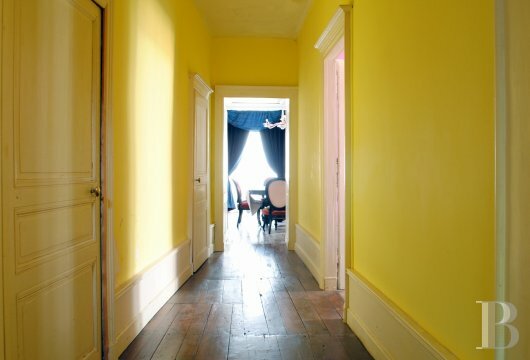 Numerous openings let in copious amounts of light which changes all through the day courtesy of its different aspects. 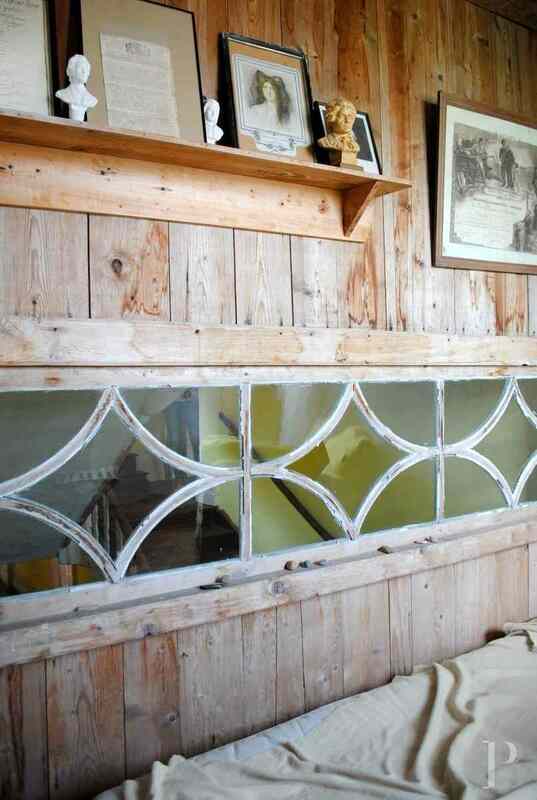 The woodwork is in a good general state of repair or is new. The superb entrance door in the centre of the facade is flanked by pilasters supporting a half-moon shaped lintel engraved with the words “l’an premier de la République” (the first year of the French Republic). 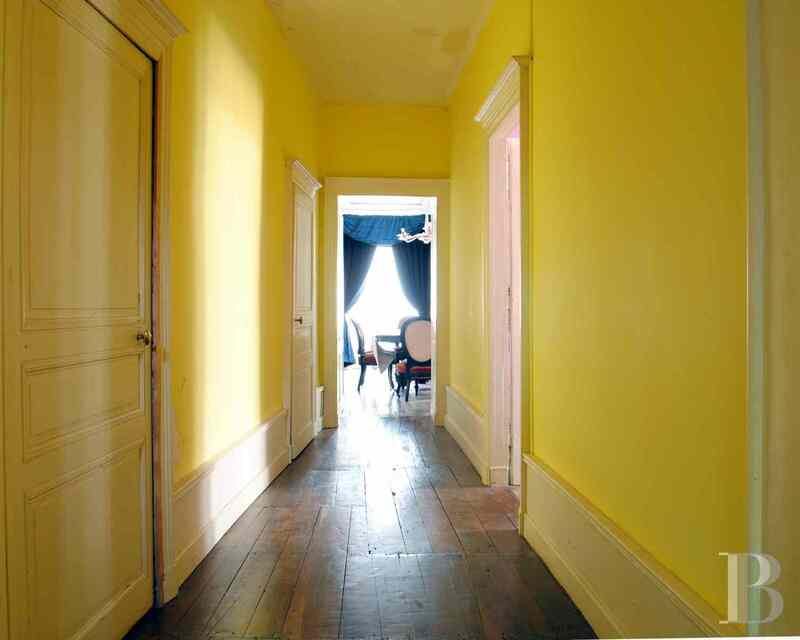 The short passageway from the entrance opens, on the left-hand side, into a first lounge and, on the right-hand side, into a study or a bedroom. The lounge is particularly warm and welcoming courtesy of its exposed beam system, its superb old flooring and its elegant fireplace. The second lounge, just as pleasant, is next to it. A small door in the latter opens into a large 60 m² room, the old ceiling of which is 5 m high and features exposed beams and planks. 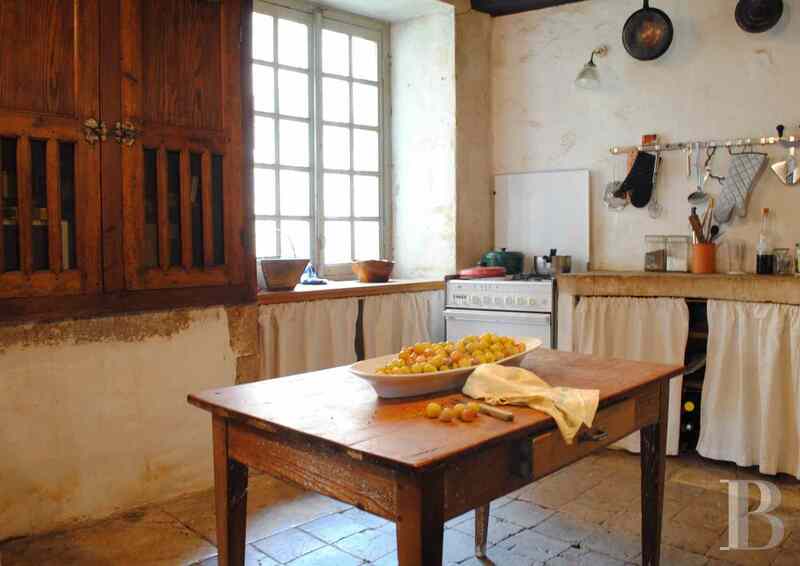 The winter kitchen still has its original terracotta floor tiles, its fireplace and its old larder between whitewashed walls. The good-sized dining room includes a false partition wall which cleverly conceals cupboards. 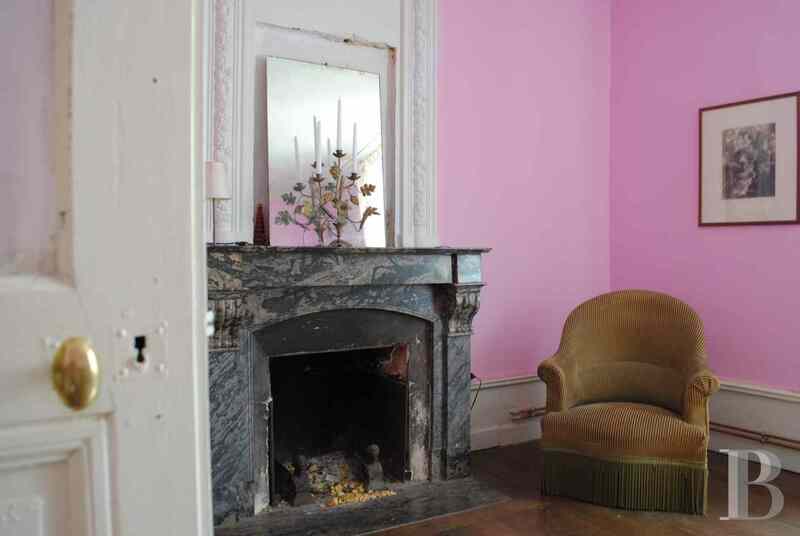 The marble fireplace with stucco decoration dates from the Napoleon III era as do the ceiling mouldings. A half-turn stairway with a wooden intermediate landing leads to the first level comprising four large bedrooms, respectively white, blue and grey, the last one being referred to as the “garden room”. The grey and blue bedrooms share a wardrobe. 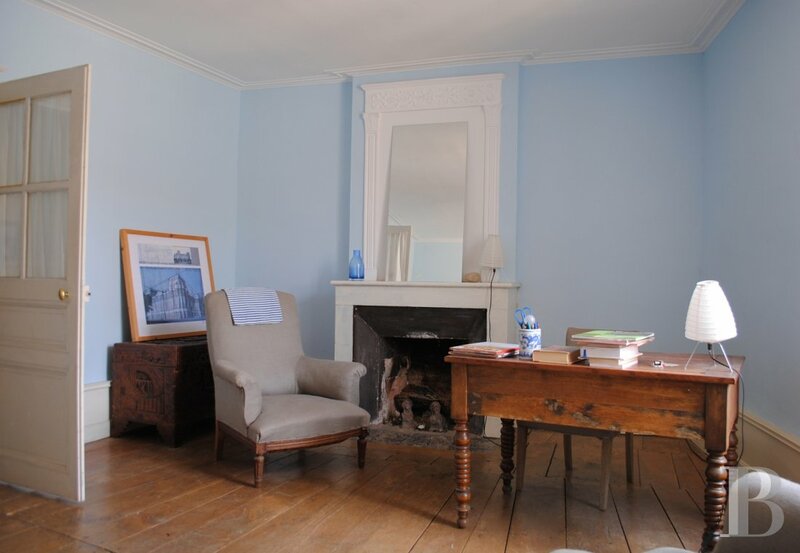 The garden room adjoins an annex room in use as a study and the white bedroom has a toilet. This level also includes a shower room. A large bedroom and its bathroom take up one corner of this floor with its sloping ceilings. The library is set out in another corner, surrounding the stairwell. 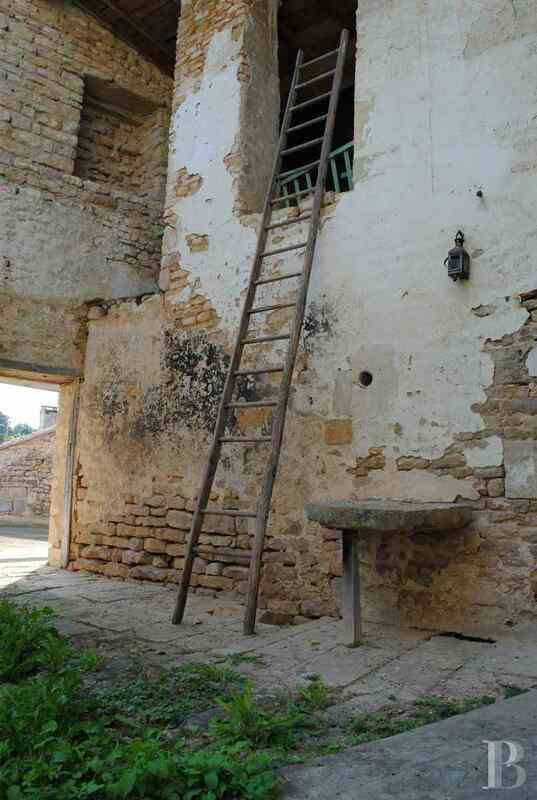 Two steps on the north side lead to the linen room and, at the end, to an attic. The house’s main stairway is extended by a straight flight of steps going down to the garden level. 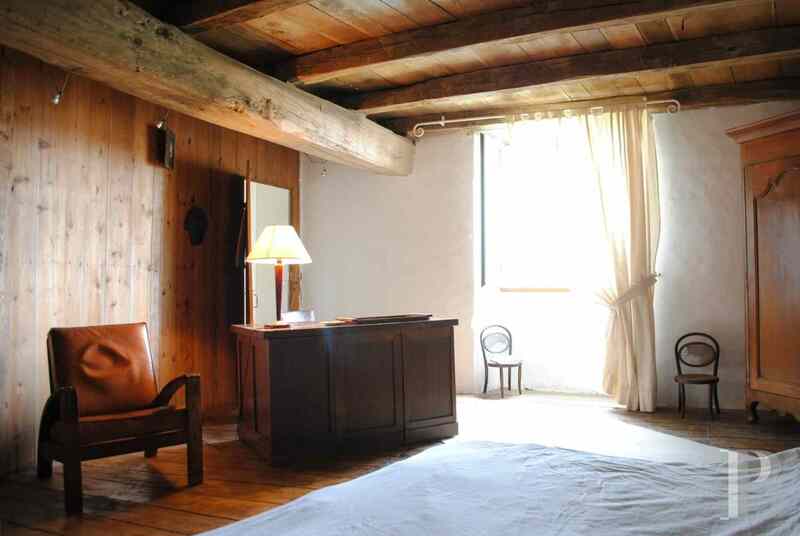 This floor comprises three separate areas: a summer kitchen with the boiler room (wood-pellet boiler), a large bedroom and its shower room as well as a superb age-old cellar hewn out of the rock. In front of the kitchen, climbing plants cover the pergola, forming a delightful setting for lunches and summer evenings. The bedroom with its shower room and its toilet can be reached directly from the garden. The polished concrete floor and the exposed ceiling beams create a highly aesthetic contrast effect. 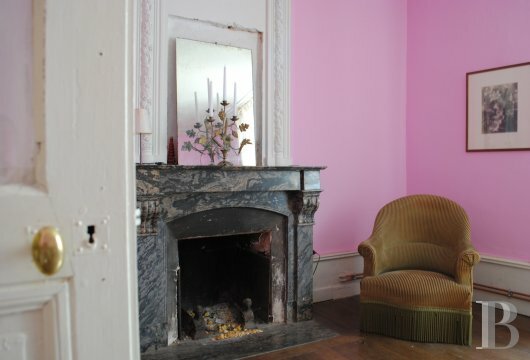 There are numerous clues to suggest that this intriguing house is not what it seems. The main entrance is in the tower; on a lower level towards the south side, other doors opening off the street lead directly into rooms on the ground floor. The Romanesque tile roof needs redoing and the inside requires full restoration works. The facades are similar to those of the large house and could do with rendering. The south side of the building comprises a lock-up garage. 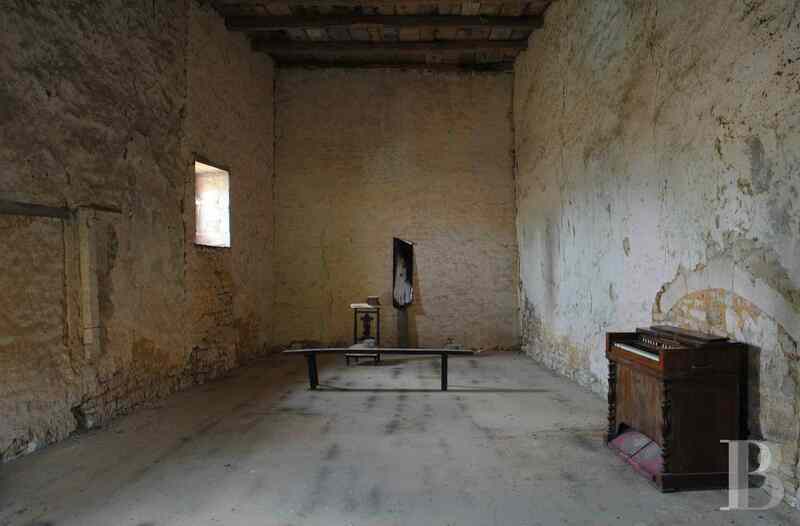 This floor comprises four rooms which were once used for utility purposes. 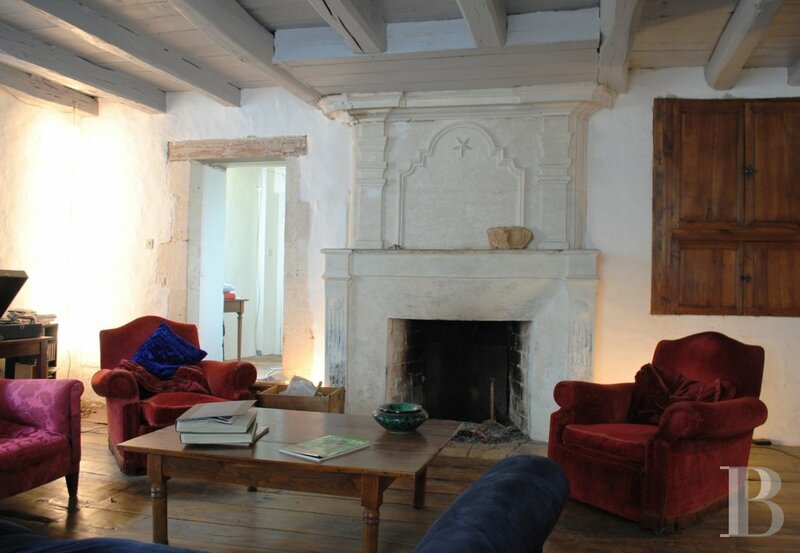 They include a bread oven with superb Medieval flagstones and a wonderful vaulted cellar. Straight stone steps provide a second access to the first floor. 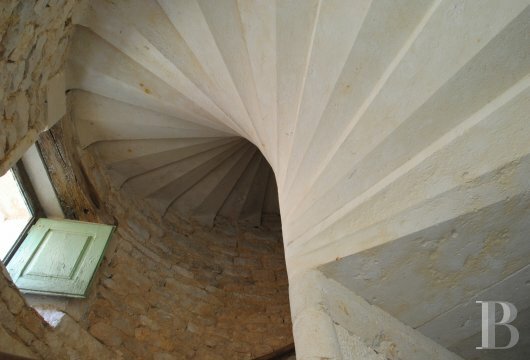 A stone spiral stairway housed in the tower leads up to this first floor. 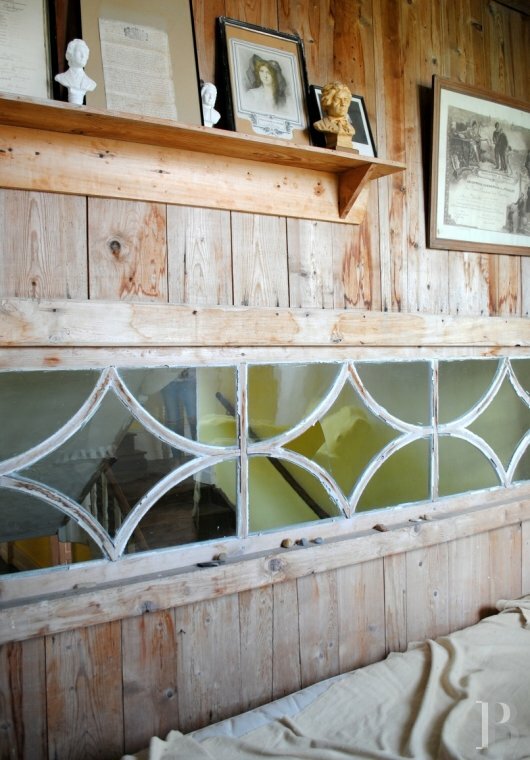 Small windows illuminate the passageway. Despite the date engraved on the keystone over the door, it would appear that this small tower has Medieval origins. Its roof has unfortunately been truncated and topping it with a candlesnuffer roof would greatly enhance the overall appearance of the house. Four rooms, many of which have fireplaces, await restoration works. 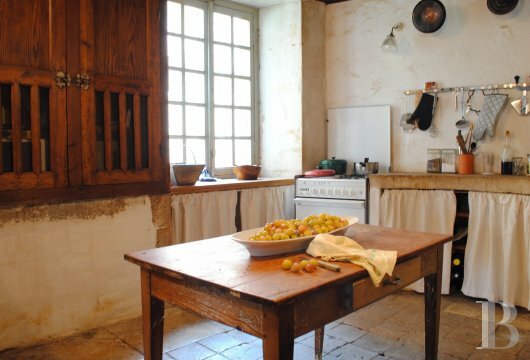 A south-facing terrace is next to the kitchen. 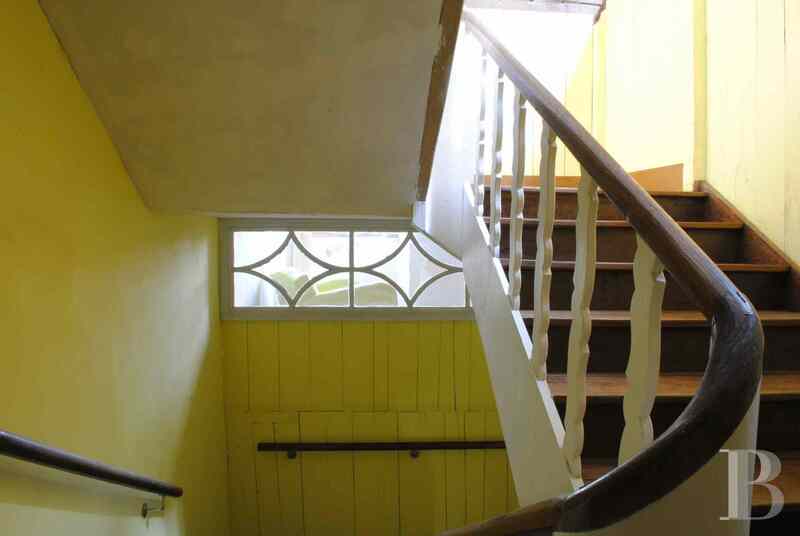 This floor can also be accessed via the straight stairway near to the bakery. 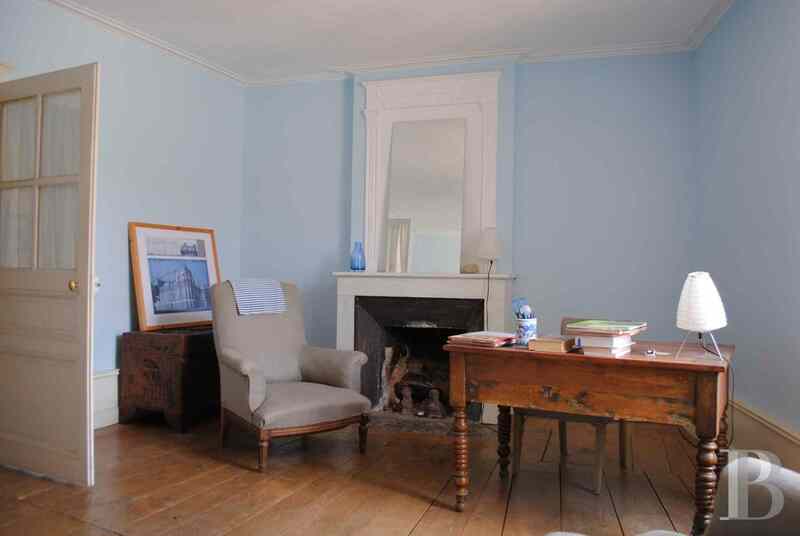 The three rooms that share this floor are of a good size and two have fireplaces. One has a loggia that looks down on the terrace. The outbuildings comprise miscellaneous buildings that are no longer in use. One has a strange-looking double bread oven, another was the old laundry room and a third was used for housing carriages. All are in need of full restoration works. The slight air of mystery surrounding this residence and its origins can but make it even more exciting. 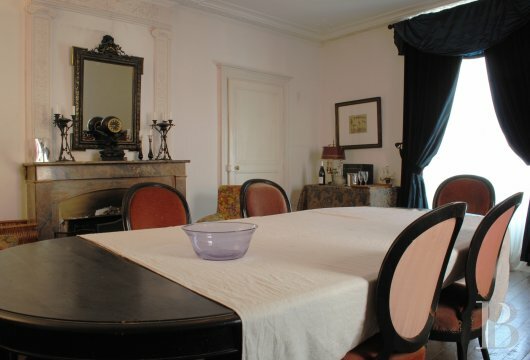 This region is not lacking in attractions and the same can be said for this property: its external informal appearance is the mark of a noble ancestry, betrayed by its style and its look, deeply marked by the aesthetics of the 18th century, much sought-after today. It is in a good overall state of repair and could be lived in as a main residence without having to carry out any works. With its swimming pool and its pergola, it already forms a dream setting for long weekends and holidays with friends or family. 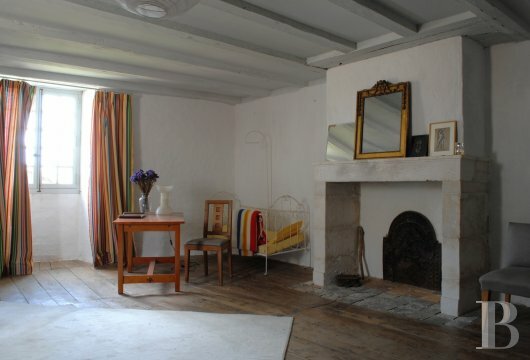 Its many rooms and annex buildings could be used as studios for artists or workshops for craftsmen, both professions being able to put these spacious rooms exuding character to good use. 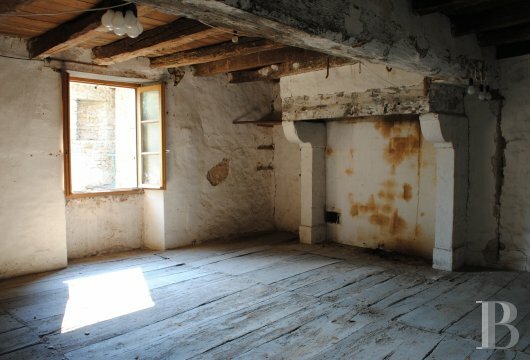 The potential contained in the second house in terms of restoration projects also includes the possibility of a bed & breakfast activity.